O Grupo de Investigação em Estudos de Tradução e Recepção do Centro de Estudos Anglísticos da Universidade de Lisboa – CEAUL convida para o 13 ETC … Estudos de Tradução à Conversa, que se realizará na quarta-feira, dia 20 de Fevereiro, no Anfiteatro III da Faculdade de Letras da Universidade de Lisboa, das 16h30 às 18h00. Para esta conversa convidámos a Dra. Cristina Mendes que nos falará sobre A tradução no Banco Central Europeu. 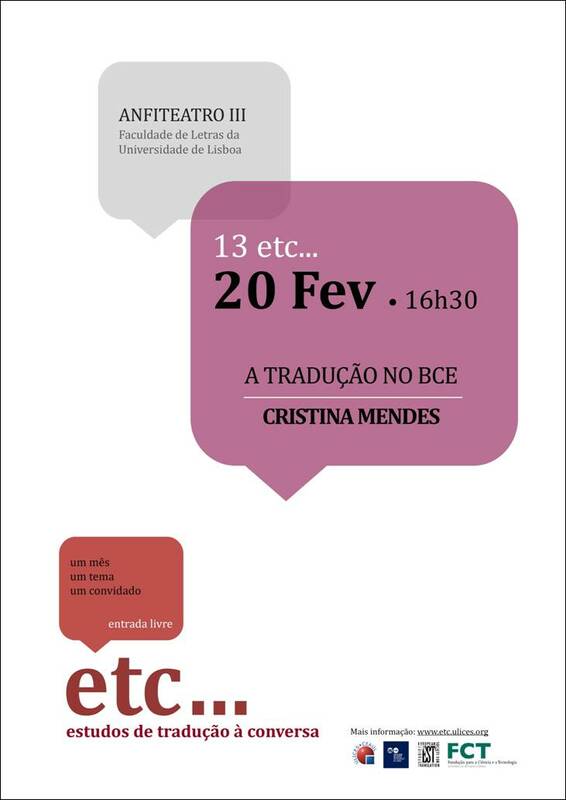 The University of Lisbon Centre for English Studies – ULICES Research Group in Translation and Reception Studies invites you to 13 ETC… Talks on Translation Studies, which will take place on Wednesday, February 20, in Anfiteatro III, Faculty of Letters, University of Lisbon, from 4:30 pm till 6:00 pm. Our invited speaker is Cristina Mendes who will talk about Translation in the European Central Bank. TheETC… Talks on Translation Studies is an initiative that promotes monthly informal talks on a range of relevant topics for Translation and Interpreting Studies. These talks count on the participation of various translation researchers, scholars and professionals, who are invited to make a brief presentation (20 to 30 min. ), which is followed by an open discussion (45 to 60 min. ).